A few words before we start. As we develop DragonFeed, we constantly think about how to make this game more appealing to general, non-blockchain audience. A lot of work was done to make this game as familiar to casual players as possible. DragonFeed will only be a part of the whole bunch of products that will allow to attract a lot of non-blockchain users to blockchain gaming. One of these upcoming products is a Platform for game developers — a set of tools and services that allows a more flexible integration of blockchain into their games. We’ll tell you more about it in our future articles. So what’s DragonFeed? It is a platformer game on mobile with collective action gameplay features. The game takes us to the dark caves of Dragonpit where the Little Dragons are in rush to collect precious resource — Petrichor — to feed the Big Dragon. Player is presented with opportunity to become one of Little Dragons, jumping through the spooky corridors deep underground. Collective action gameplay — rewards are distributed to each player particularly after enough resources have been collected by all the players in general. Free gameplay — one can play the game, level up and receive lootboxes without need to pay for gas (blockchain transaction fee). Blockchain rewards — player pays only for opening the lootboxes. Lootboxes contain boosters and skins that are stored on Ethereum blockchain. Fair play — the more resources user collects, the more epic lootbox (with better items) he receives. So, without further ado let’s jump right into details! We believe in the power of decentralized action of participants for the common good. 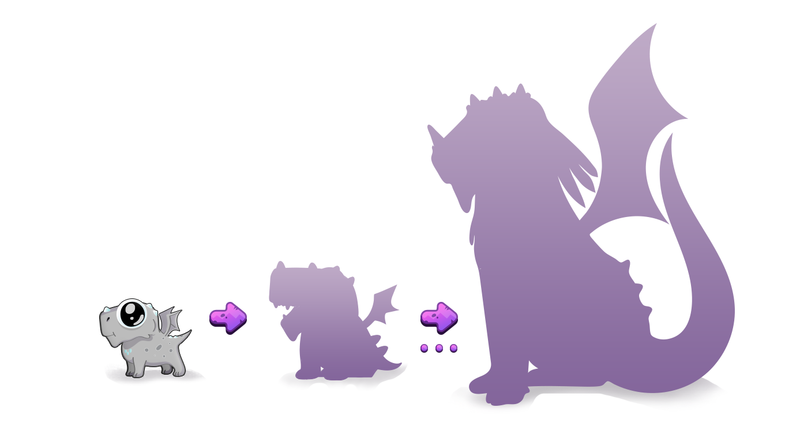 In DragonFeed, rewards are distributed after a milestone is completed and the Big Dragon can evolve to his next stage of growth. So each piece of petrichor collected by each individual player matters! Those who collect relatively more petrichor will be encouraged — they will receive a reward of higher value. There are four rarity levels of crystals (Common, Rare, Epic and Legendary) that act as a lootboxes. The higher crystal rarity is, the better reward it holds inside. Rare, Epic and Legendary crystals. The better the crystal, the better the reward. We dream about making blockchain gaming more appealing to traditional gamers, user-friendly and easy to start playing. That’s why we are working on a Platform for building cost efficient and fast blockchain games. Thanks to our upcoming Platform for blockchain games developers, players can receive crystals with no need to cover the cost of Ethereum transaction. Gas fee is required only in order to claim the blockchain version of crystal (and hence open it). Тhis allows players to always enjoy the game, even if one can’t cover the cost of transaction at the time of reward distribution. You may continue playing and open the crystals any time you want. At the very beginning players get a tiny dragon cub, but feeding him with petrichor you’ll raise him into a mighty Big Dragon. After that he will fly away, rewarding all the players for their parenting. This is a special occasion for DragonFeed community — extremely rare and unique items will be distributed only to players who took part in feeding of the Big Dragon. These items will be issued in limited numbers. Be sure to grab them — with time they will grow in value and will always remind you of a Dragon that you have helped to raise. After the Big Dragon flies away, you get a new dragon baby to bring up with other players. The cycle repeats. During the level, player has to pass a number of screen-sized rooms made of tiled blocks and challenging obstacles. Player is given only two attempts to pass a room, so he needs to use all of his skills to reach the end of the level. But it is not just about passing the rooms, it is also about collecting as many petrichor as possible. However, your skill is not the only asset in this game. Blockchain powered cross-platform boosters will help you to get through even the knottiest levels. What are these boosters? Well, they are blockchain-based items that give you special abilities during the play through the levels. Magnet — all petrichor in a large radius around you will be drawn thus collecting petrichor becomes as easy as it can be. Double Jump — it is often quite hard to make a jump right. No more worries about reaching upper blocks — make a second jump while your character is in the air. Invincibility — nothing will be able to kill you. Literally. Nothing. Of course this booster will maintain its effect only for a short time and can be activated only once per room, but with right timing you will have an impressive advantage. We are going to have about 10 boosters at the time of game release, and will continuously increase this number after the launch of the game. We have already shared our excitement about the concept of cross-game items. The ability to have items that are shared across different games is one of the most powerful features that blockchain brings to the gaming. DragonFeed will support Dragonglass Miner skins. Hence, after player will log in with his wallet into DragonFeed, he will automatically get access to some items (again, no need to pay a transaction fee for that — you already own a cross-game item on blockchain). As any blockchain asset, skins and boosters will be available for purchase on the market. But we will allow to trade not only blockchain items, but also the crystals (lootboxes), that you receive after each Dragon’s growth milestone. Collect as much petrichor as you can during a milestone. Get a crystal during general reward distribution. Pay with DGS for full access to the crystal (at this point crystal will be transferred to your wallet). You are free to sell the crystal or transfer it elsewhere at this stage. It’s yours! Crack the crystal — player will be able to speed up cracking time by increasing the price he pays for this operation. Receive a blockchain cross-game item — skin or booster (and they can take on any other role in games supporting cross-game items, like weapon, armour, vehicle etc.). Obviously, it will heavily depend on the feedback that we receive from the early adopters during the closed beta testing and from other users after the launch. We have already presented a development build of DragonFeed on Crypto Games Conference 2018 in Minsk. A valuable feedback from not only developers but also the real players convinced us that we are moving the very right way. Our collaboration with professional game designers played a huge role in that, and now we have a perfect chance to make DragonFeed even better. That’s all for now. Wanna know more? Follow one of our social media accounts or subscribe to our newsletters and we will provide you with the latest info on our working process.